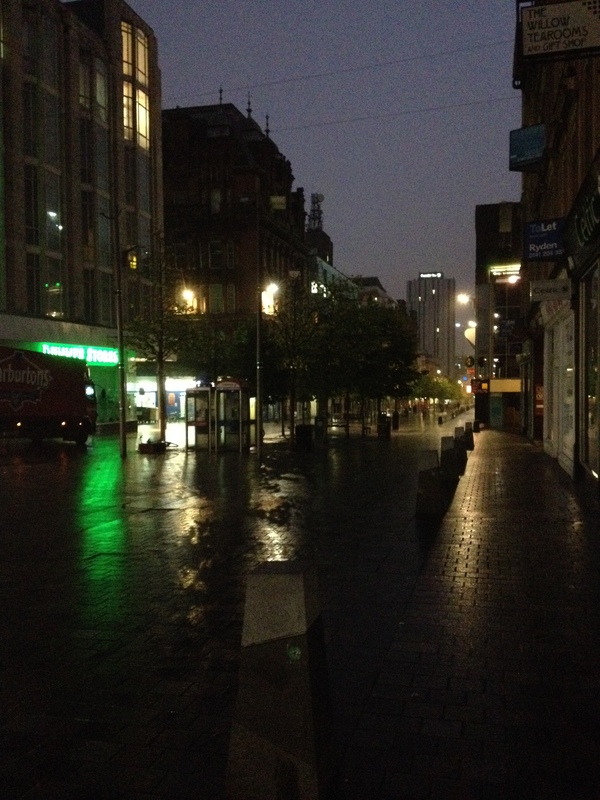 Glasgow at 5.30 in the morning is not a buzzing place, on normal days. I discovered this on the day of the Scottish referendum – not a normal day, of course, but not yet the wild, strange time it would become. Street-cleaners, and no one else, went about their business. I’m used to London, to something always being open. As I walked up West Campbell Street, I remembered that not all cities are the same. It was dark. A few people, night watchmen about to come off duty, smoked outside buildings. Coffee, coffee, my brain repeated, a silent prayer. It sent signals to my optic nerves, tightening my vision at the sight of a lighted café window. But no, of course, nothing was open. Twenty-four hours later I walked the streets again in the early hours of the following morning, still awake. The streets, after a night of high emotion, drinking, laughter, threats, and hope and the end of hope across the city, were once again almost empty. The whole place had felt wakeful to me as we zoomed around it through that night, on foot and in taxis. But as I walked home I realised that, probably, most people slept through the key hours. 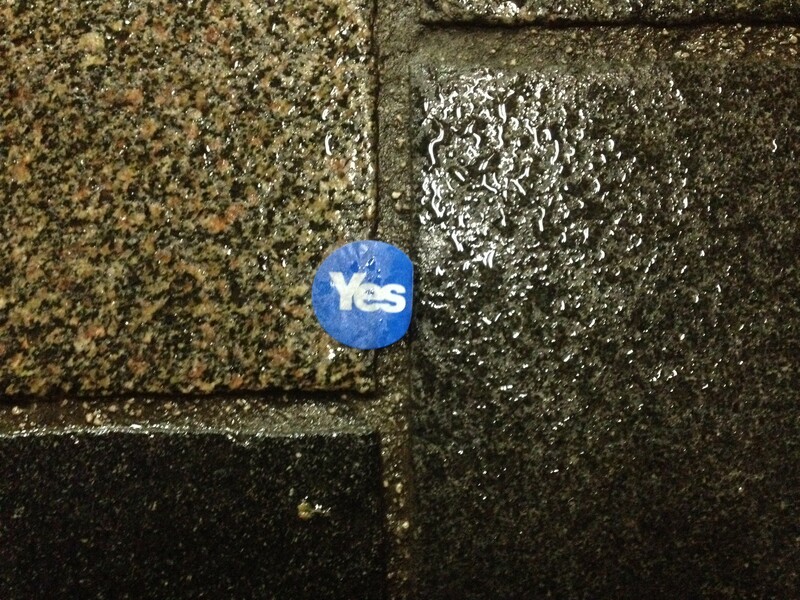 I found a blue-and-white flag crumpled on the ground: the Scottish Saltire, but with the word YES blazoned across the centre. I wondered this about the undelivered Yes result, so energetically imagined by many almost half the people who voted in Scotland. It was a possible reality as I walked the streets on the morning of the morning of the 18 September. The next morning, Friday, it had gone. Tesco was open. I walked in, parched and exhausted, and bought a Variety Pack of Kellogg’s cereal. Unlike the voters, I was incapable of choosing just one option. But I knew that sugar might help me get through a few more hours. Perhaps, also, comfort. I talked to dozens of passionate Scots, from a 16-year-old with pink hair to a furious Rangers supporter drinking almost alone in a blue-painted, blue-lit pub far from the city centre. Glasgow’s geography became imprinted in my mind, like someone who has studied maps for a planned attack or escape. I sent back to London thousands of words of quotes and ‘colour’. Arriving at Euston station late on Friday, I walked in a daze through crowds unconcerned with Scotland’s entrance into new state, both changed and the same. I was glad the result was a No. But I had the weird urge to wrap the Saltire round me for that journey home – to remind, to proclaim, to pretend to be part of something I had, in fact, only glimpsed briefly. You are currently viewing the archives for October, 2014 at Opendor.